My husband has gotten the same thing for Father’s Day for as long as I can remember. And you know what? He LOVES it. It’s his favorite thing, and he asks for it every. single. year. What is it, you ask? A Home Depot Gift Card!!! To him, it’s like giving him the world. So many tools, not enough time. ☺ I like to pair a gift card with something fun, and because drill or router bits are always in high demand at our house, this year I packaged his gift card up with a set of drill bits and his favorite Reese’s candy inside a cute pail. I LOVE it! It’s really a win-win for everyone. I know he’s going to love it, and he gets to go and pick out whatever his heart desires. Whether he wants a new tool, something for the yard or garden, or building supplies for the next project…it’s there for him to choose. The Home Depot has something for every dad! Packaging it up makes a it a fun gift to give and open, and if I always include a gift receipt (for the drill bits) in case he would like a different size or brand. It just takes a few minutes to put together, but it’s everything he wants, in one tin pail! You can really have fun when packaging up a Home Depot gift card for the dad in your life, based on what he loves. To download the tag–just click on it to enlarge, right click and save to your computer, then insert it into Word as a picture. You can then re-size it as desired, print, and cut! 1. Layer the tissue paper in the bottom of the pail. 2. Add in gift card, candy, and drill bits. 3. Print and cut tag, then punch a hole in the corner and tie it on with ribbon or baker’s twine. Easy peasy, and SERIOUSLY cute! Home Depot makes it SO easy to give a gift card! Did you know you can have it sent to someone by e-mail? Or you can order one online and have it sent by mail, even attaching a Hallmark card! There’s even an option to send a group gift card, and invite others to contribute. I LOVE this idea for my dad. With all of siblings spread out across the United States, it’s a super easy way to give a gift together! I love Father’s Day with The Home Depot!! The Home Depot is giving away a $100 Gift Card to one lucky Simply Kierste reader!!! Just follow the directions in the box below, making sure to read all terms and disclosures before entering. GOOD LUCK!!!! Scott is a big Pepsi Max drinker. I would package the gift card in his next case of Pepsi as a surprise. I wold put it in a tie box and wrap it up. He would think he was getting a tie, til he opened it. I am never very creative with gift wrapping so my presents are simple… Wrapping paper and tag! I do love your idea with a bucket and goodies!! I would make it a treasure hunt with the clues in the bucket! I would put it in a basket with candy and scented candles. I would keep the Home Depot card for me and give him a Barnes & Noble Card – that’s his dream-shopping. I would put it in a popcorn serving container, because he loves his big popcorn maker, along with his favorite candy and his favorite mixed nuts. – Sweet and nutty, just how we love you. Gift cards to home improvement stores have always been a hit in my house – for mom or dad! Since we have little kids, we’d likely pair the gift card with some homemade cards/drawings. Because we’re simple like that. I would package a gift card in a tool bag for my husband. yikes, we are not very creative with gifts..; i love your idea though! I would creatively put the gift card inside the envelope it comes with and tuck it inside a Father’s Day card :) I do like the cute bucket…maybe I’ll get there. 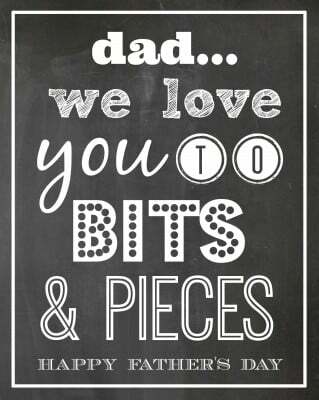 Oooh, this is such a cute Father’s Day gift idea! And an awesome giveaway, thanks for the opportunity! I’m not sure how I would “creatively” package it though… I like Libby’s comment above! lol! Another great idea!!! Thank you!!! I love your idea of packaging. You always have such great ideas! My husband would love this gift card….we have A LOT of projects we could use it for and my husband always has his eye on a few tools!!!! I would attach a little bag of chocolate covered bacon to it. Love the idea!! Sooo adorable!!! I love this idea! I am not very creative so I would probably steal your idea :) I would try to implement some more of his favorites. I’m not creative, but the galvanized bucket with some of his favorite liquors would be fun! My hubby goes to Home Depot almost everyday so I would use your idea! So super cute! I love it! I would put it with a new wallet for my dad. I just might steal your idea, but also a bucket of duct tape would be a good start for him! I’d put the card in a small freezer bag and put it into a cake (like the old baking a file or saw into a cake, and he could buy files and saws with the card). I wouldn’t actually bake it in, but perhaps put it on the cake and cover it with frosting. Seriously.Love!!! What a fun and creative idea!! I would combine it with a popcorn, coke & candy bucket for a family movie night on father’s day. Then he’d get the home depot card for later! I would combine it with IBC Root Beer 6 pack and a giant Reese’s Peanut Butter Cups. I would put it in one of those orange Home Depot buckets (which he loves and uses all the time). Our dog thinks that the bucket is her play toy which is quite fun to watch her flip it up in the air and chase it. Needless to say, we are always needing a new one. My daughter finds it hard to get anything for her father (an ex) as usually he’s pleased with recognition. He’s not very handy either. But this is a cute idea. If my dad was still with us I’d include his favorite black jelly beans. I would wrap it up in muslin (or a drop cloth) and tie it with a tape measure. He would definitely need a chocolate tool set, bandaids and his favorite bbq sauce added in the bucket! I’m not sure. I have a really hard time with creative guy gifts. Ibc rootbeer is our one never changing gift for my husband so I’d have to come up with a cute little phrase to go with that and tie them together! I think he’d be happy with a new work shirt and the gift card tucked into the pocket! Love the pail idea. Last year we did the big poster sign with all the candy bars message and he loved it so he would love the pail idea. My husband loves gum so I’d give him a toolbox with gum saying “your EXTRA special” with extra gum in it….corny but cute for him. I would get him his favorite magazine and put it inside on a random page. Thanks for all your creative ideas! My dad loves trains, so I would package the gift card in some sort of handmade train display, that my toddlers would help me decorate. Maybe a cute engine with “DAD” on the side? Thank you for the wonderful giveaway. I would have to package the gift card with bacon, bacon and more bacon! I am designing a mug for him with pictures of our family and a poem. I would put the Home Depot Gift Card inside of a homemade card that my daughter made for him and place it inside the mug. I would make it into a gift basket with his favorite candy, snacks and some music. I would put it the card in a gift basket with jerky and cheese. I’d give it to my Toddler to hand to his daddy. 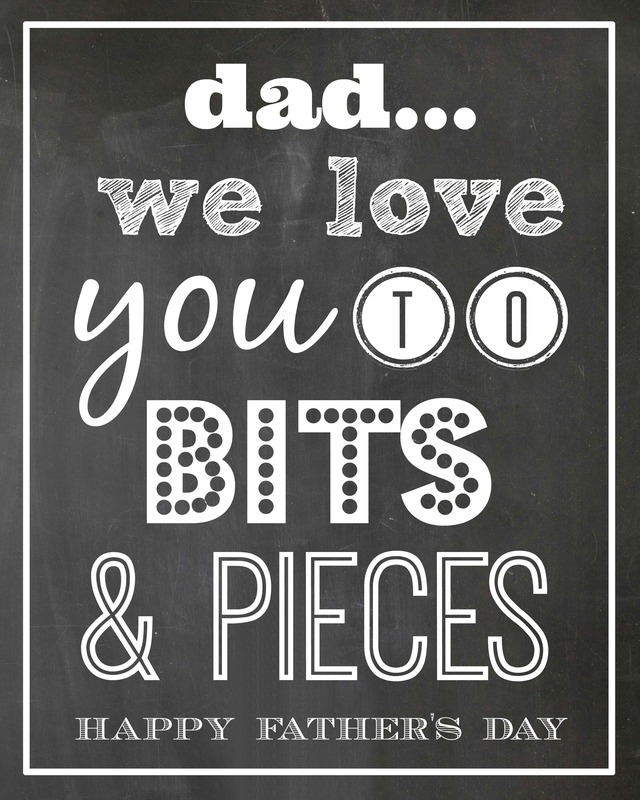 Love the idea…making it for my Dad!! I would probably find something cute like this on pinterest and copy it :). I would look on Pinterest and find something cute to copy! I love it. He loves Home Depot (like a kid in a candy store!). And I love the help on how to make it cute and clever! It’s a win win! Thanks Kirsten! I would give my hubby (a cat dad) cool home improvement stuff in a nice portable tool box. His is a little wore out. Your ideas are always so adorable. Thank you so much for the free gift tag & the wonderful ideas! You are a blessing, Kierste! I would probably try to package mine exactly as you did! After all, my mother always told me that imitation is the sincerest form of flattery! :o) Yours looks perfect! I am giving a collage frame with pictures of our kids. I would put the card in one of the openings. I would include it inside a new tool box because he really needs a place to store his tools! Well aside from copying your awesome packaging… I might use a basket (that I painted orange) … I like the idea of the candy too! my dad is mr handyman so he would love a small toolbox filled with some basics! My son is going to become a “bonus” (step, but I hate that word) dad to five kids in December! He loves fishing, especially with his fiance and the kids, so his gift card would go into a tackle box filled with fishing goodies! So cute, Kierste! Excellent job as always! My husband loves to order hunting and fishing stuff online, so I would put in a package in the mailbox made to look like something he ordered. Sadly, I’m not as creative as you, so I would probably use your idea! I really like your idea. My dad and my husband would love this. This is a great idea for my dad to get from my kids… is there anyway you could make me a Grandpa tag? I would put it in a new tool box. My husband goes to Home Depot often, it is “his JoAnn”. He love chocolate so I would have to pair it with some type of chocolate for him to enjoy. Thank you! I’d dazzle up a paint can, since most of our summer redecorating involves painting. My husband would love this gift! I can’t believe I didn’t think of this before. I would package it with some homemade baked goods! Love the way you packaged your gift! I might do something with some tools in a bucket…. I would hide it in the pile of diapers and make him search! I would disguise it in a box of chocolates for my dad. I would probably put it inside a handmade Father’s Day card for him. Your idea is absolutely adorable. I like the pail idea! So cute! Whenever my dad got us a gift when we were kids he put it in a washed out 1/2 gallon milk container wrapped in duck tape. It became a joke around our home. I think I would do the same for him. I would tuck it in a pair of socks….his least favorite gift but he always needs new ones. I’m not that creative with the packaging, but I sometimes like to hide things in plain sight and see how long it takes him to notice, so I might just tuck it into the top of a book like a bookmark, or stick it in his wallet or something like that. I would put it inside a small box, wrapped in duct tape.. Put that into another bigger box, wrap it in more duct tape. Continue that and put it in like 3 more boxes, for the ultimate unwrapping experience! LOL!! I would make a bouquet of paper flowers with the honey do’s I would need done along with the gift card and some of his favorite treats.. and a few of his other favorite things. Thanks so much for the chance.. love your blog..
I’d put it in a package with a few small tools like a screwdriver and a favorite treat! How fun! I would put it in a tie box so he would think that he was getting another tie but then be surprised when it opens the box and finds this fabulous gift card instead! My husband loves his riding lawn mower…he lets the kiddos ride with him but wont allow me to touch it! I would tie the gift card to the steering wheel of the mower with a big red bow. He would see it when we pull in the garage after church! I would hide it in his toolbox, so he could find it at the perfect time – while working on projects! He’d be elated! I’d attach it to a tool with a cute note. My husband so deserves a gift card from Home Depot:) I think I would pair it with his favourite candy bar. Maybe I would put it in a new tool belt filled with his favorite candy. I would package it in a small toolbox. I love your idea too! I thought a car washing bucket from Home Depot with some car washing supplies and gift card would be a fun idea too! My husband loves a clean car! I’d use a nice can above and fill it with boxes of nails and screws. I’d put it in his favorite candy w card. It would all be used fast!! I would put it in a tool belt! It’s possible I’d personally use it within a fresh instrument belt full of their favourite candies. I love your blog. You are so creative! thank you! I would make it look like the bud of a flower and put it in a pot with the new vines he wants for our front yard. In a canvas 6 pack cooler with beer, some fishing lures, and a get out of yard work Satruday ticket. My husband is in need of some new tools. This gift card would be perfect. He will be gone on Father’s day doing his summer national guard training but we can give it to him with he returns! I love the pail idea. We are planning to pain the outside of the house so this gift card would be most welcome. I might wrap it up in a painting drop cloth. Pretty sure I’d copy your idea!! It is SO cute! I love this fun idea of the candy with the tools- cute! I would probably do it just like you although I would consider hiding it in the middle of big jar of candy so it would be a really great surprise. I’d put it in a terra cotta pot along with some gloves and gardening tools. I’d use it as a bookmark in his book!